American actor Marlon Brando has fascinated the public with his intense onscreen presence. His film career began in the 1950s and has included powerful roles in such classic films as On the Waterfront, A Streetcar Named Desire, and The Godfather. Marlon Brando was born in Omaha, Nebraska, on April 3, 1924. When he was six years old his family moved to Illinois. His father was a salesman and his mother acted in amateur plays. Brando did not have a happy family life. He frequently argued with his father. He also did poorly in school. Sports and dramatics were the only things that interested him. He failed all other subjects. In an effort to control Brando and give him some discipline, his father sent him to a military school. Brando was seventeen years old at the time. He stayed there for almost three years, but he refused to respect authority and caused so much trouble that he was expelled in his senior year. Because of his behavior, Brando never graduated from high school. He has said that not having a high school education and diploma has always been a source of embarrassment for him. Brando returned to his family and ended up taking a job digging ditches. Finally his father offered to finance his education. Brando moved to New York, where one of his sisters was trying to become an actress. He began to study with the famous acting coach Stella Adler at the Actors' Studio, a very important acting school. While at the Actors' Studio, Brando learned the "method approach." In method acting actors are taught to draw on their own personal emotions and experiences as a way to portray their characters. Older acting systems relied heavily on teaching actors physical gestures as the way to express themselves. Brando made his Broadway debut in I Remember Mama in 1944. The New York theater critics voted him Broadway's Most Promising Actor for his performance in 1946. In 1947 he played his greatest stage role, Stanley Kowalski in Tennessee Williams's (1911–1983) drama A Streetcar Named Desire. Before James Dean (1931–1955), Marlon Brando popularized the jeans-and-T-shirt look, as a movie idol during the early 1950s. Hollywood was impressed with Brando, and in 1950 he made his motion picture debut as a severely injured war veteran in The Men. He went on to play Stanley Kowalski in the 1951 film version of A Streetcar Named Desire. The movie was both a popular and a critical success. Brando played a variety of different characters over the next several years. In his next movie, Viva Zapata! (1952), he played Emiliano Zapata, who rose from being a peasant (a poor farmer) to becoming the president of Mexico. He was Marc Antony in the film version of William Shakespeare's (1564–1616) Julius Caesar (1953). 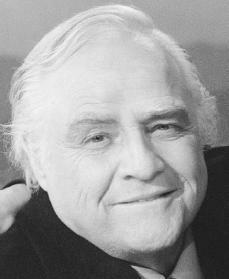 He played a motorcyclegang leader in The Wild One (1954), portrayed Napoleon Bonaparte (1769–1821) in Désirée (1954), and sang and danced as Sky Masterson in the musical comedy Guys and Dolls (1955). Brando won his first Academy Award in 1954 for his role in On the Water-front, a hard-hitting look at New York City labor unions (a workers' group organized to help workers receive fair wages). From 1955 to 1958 people in the movie industry always voted Brando as one of the top ten film attractions in the nation. During the 1960s, however, his career had more downs than ups. In 1962 Metro-Goldwyn-Mayer (MGM) studios decided to remake Mutiny on the Bounty, which had originally been filmed in 1935. The movie was a disaster at the box office. It failed to earn even half of its enormous budget (the money it cost to make it). Brando's excessive self-indulgence (spoiled behavior) reached its height during the filming of this movie. He was criticized for his tantrums (fits of bad temper) on the set and for trying to alter the script. Off the set he ate too much and would not associate with the cast and crew. For the rest of the 1960s Brando acted in several movies, but none of them was considered to be of very high quality. the Academy Awards ceremony to personally deny the trophy. Instead, he had a Native American Apache woman named Sacheen Littlefeather read his protest. In 1994 Brando changed his mind and tried to get the gold Oscar statuette, but his request was denied. Brando continued to work in many films after The Godfather, both as a star and in smaller roles in dramas and comedies. Critics have said that both the movies themselves as well as Brando's performances have been of very uneven quality. Young people who have not seen Brando's amazing efforts in his early films will not find the same genius in his later movies. The small roles he has played do not demand the acting range for which he had once achieved so much praise. The unhappy family life Brando had as a child has been mirrored in his own family life as an adult. He has had many failed marriages and has experienced personal tragedy from the actions of two of his children. A son served time in prison for manslaughter and a daughter committed suicide. Brando's years of self-indulgence are visible. He overate until he weighed well over three hundred pounds in the mid-1990s. However, to judge Brando by his appearance today and dismiss his work because of his later, less significant acting jobs, would be a mistake. The range of the roles he played is a testament to his ability to explore many aspects of the human psyche (mind). Brando seems perfectly content knowing his best work is behind him. He still remains an influence for actors today, and has won popular acclaim and critical consensus as one of the greatest cinema actors of the late twentieth century. Cary, Gary. Marlon Brando: The Only Contender. London, England: Robson, 1985. Nickens, Christopher. Brando: A Biography in Pictures. Garden City, NY: Doubleday, 1987. Schickel, Richard. Brando: A Life in Our Times. New York, NY: Atheneum, 1991.